In Memphis, it rained 20 out of 28 days in February. And it’s been raining for the last few days. For me, rain means I get to break out my favorite trench coat. My friends say I’m a little “extra” so of course I didn’t just go with a traditional, basic khaki trench. Nope. 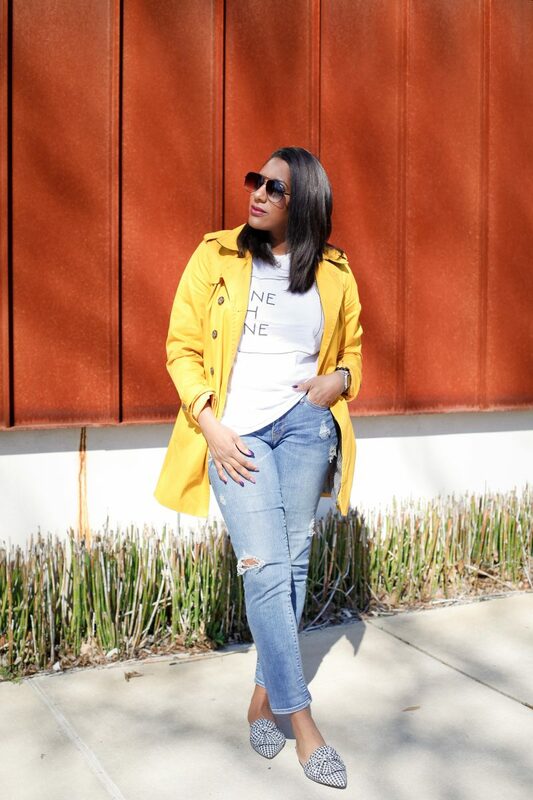 I went for yellow…bright, bold, and my favorite color!! You see, I really like for my coats/jackets to make a statement, so when I saw this one a couple of years ago I knew I had to have it. If you follow me on Instagram (if not, you’re missing out!! Follow me now cuz I’m a hot girl – @accordingtoq), you saw me post a picture of this look on my InstaStories a few weeks ago. Dr. Superman, my ladybug, and I were out and about on a gloomy, rainy day. 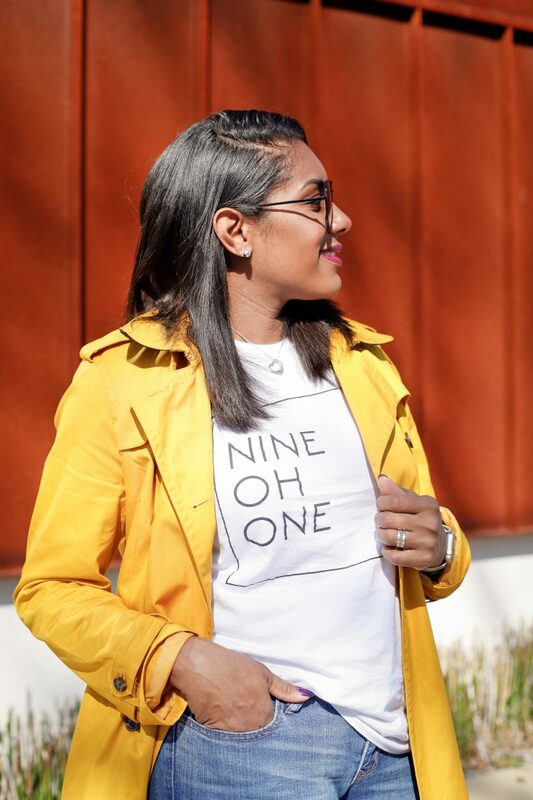 We were going to be doing a lot of walking so I threw on my ‘Nine Oh One’ tee and my gingham mules (I’m obsessed…gingham is so hot this season). 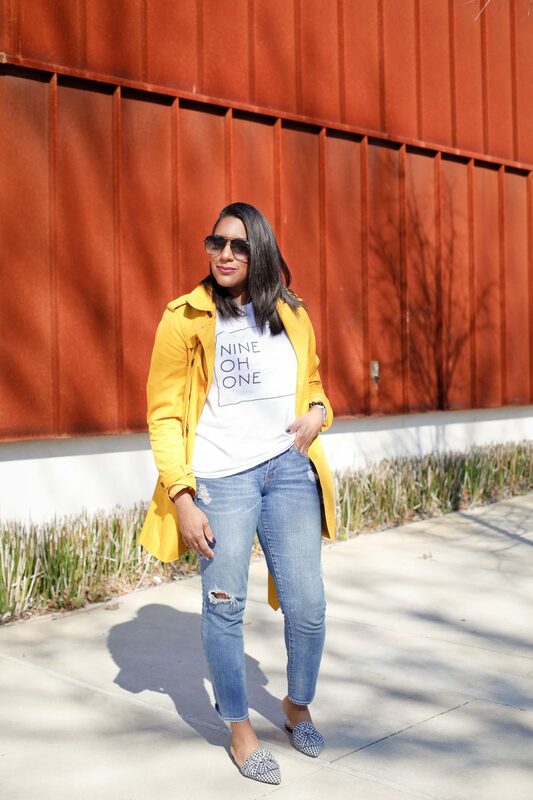 The trench added the perfect punch to an otherwise really casual look on a dreary day. What do you think? 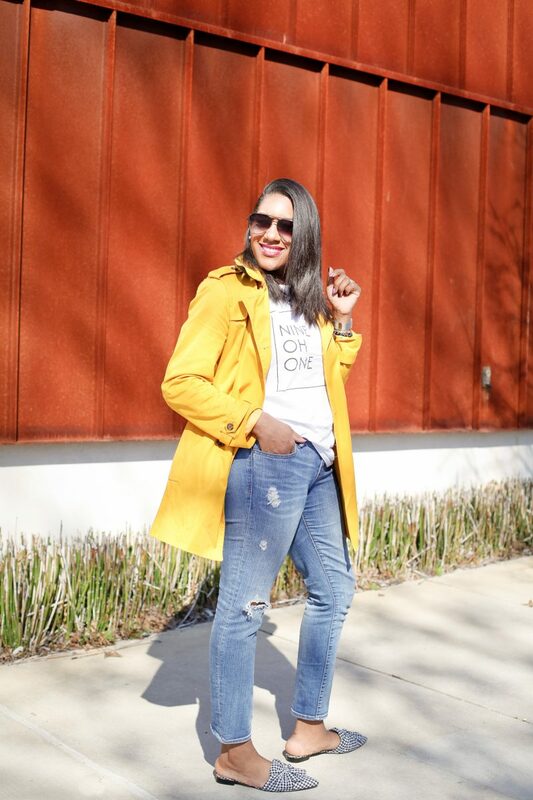 According to Q, rainy days don’t have to be any less stylish! 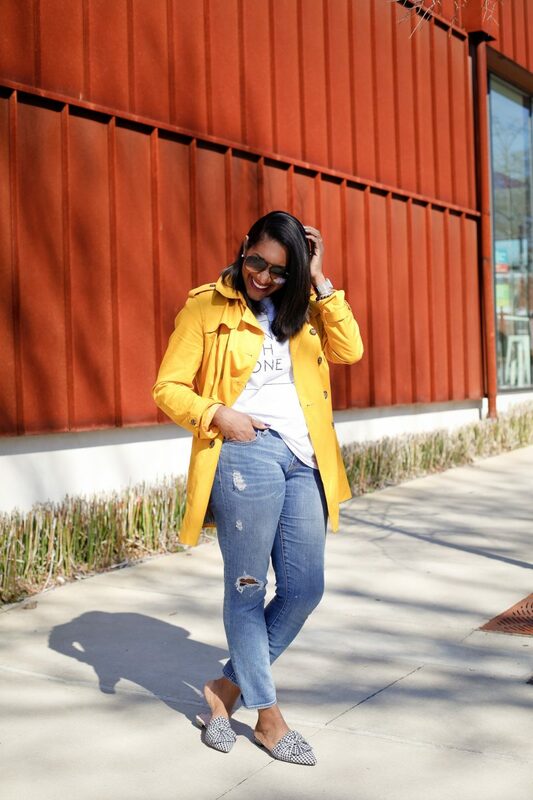 Grab a trench or raincoat in a bold color or print and you’ll be the one making a splash on a rainy day! Cheers to colorful and stylish rainy days! Here are a few trenches I’m loving around the innanets! 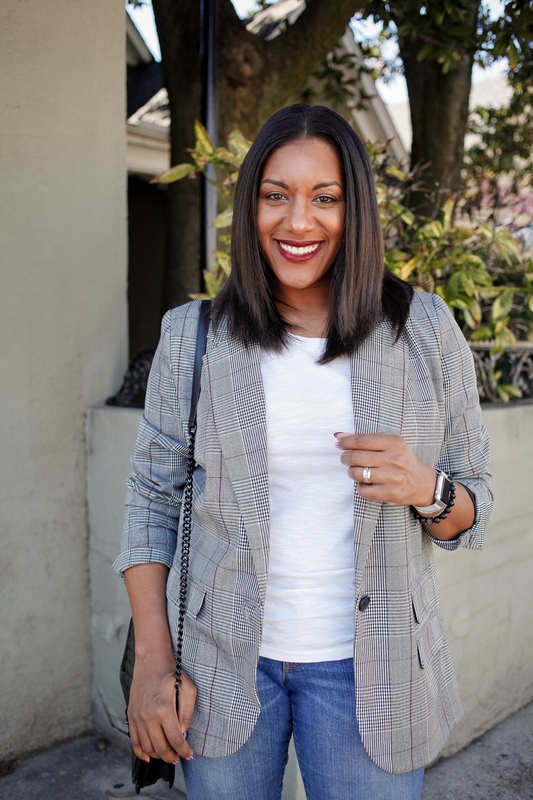 Next Post It’s White Tee & Blazer Season!! I look forward to your blog each week. You never disappoint. Such kind words!!!! Thank you so much for reading. I truly appreciate it!! What a cheery trench coat. Love it! Thank you!! 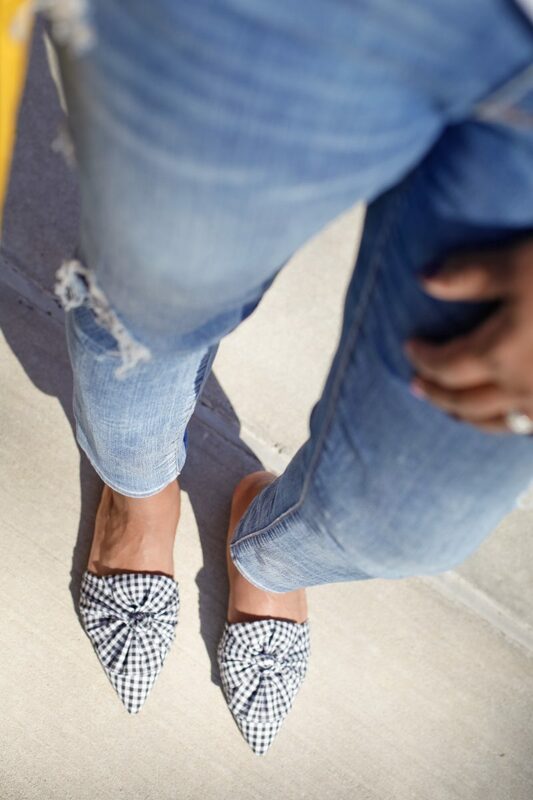 It definitely brings sunshine on a cloudy day! Thanks for stopping by.